I recently had an opportunity to watch a class of 4th graders attempt to take a PARCC test via the TestNav website. I was disappointed by the interface, let alone how the content failed to keep some students on task. Later I googled a sample test to try it out for myself, and was absolutely HORRIFIED at what I was witnessing. 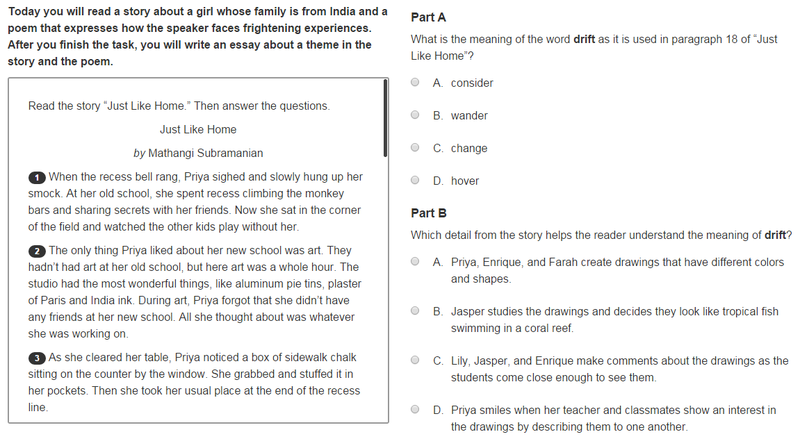 Following is a page-by-page report of the TestNav PARCC test, specifically 4th grade ELA (English Language Arts). The very fact that Pearson is behind this raises serious red flags for me. My professional experience with Pearson is that they are in it solely to make money. They don’t give a crap about content and/or actual assessments. Again, this is my own take, others may differ. Page (or screen) 1. The very first sentence does a great job at setting the scene and describing the overall objective of this test. So I read the story and moved on to the question. Or thought I had read the story. Paragraph 18? I only see three paragraphs. Oh, there are 22 “paragraphs” altogether, wow! A bit more reading to do. This is problem #1. How is a child supposed to know there is more to read “below the fold”? There are no instructions to scroll down, and the interface blankly assumes that the user inherently knows how to interpret the scrollbar near the text. Minus one point for Pearson. Problem number two; I spent about 5 minutes or so reading through this story, and this first page is asking two questions about a single word in the entire thing. So now my mind is all caught up about the definition of a single word, and the rest of the story gets flushed out of my short term memory. Final problem; so I answer two questions. What next. Ahh, yes, the right arrow button, like a web browser. Good thing there are instructions for that (/sarcasm). There is a syndicated article in the NG today talking about how the state intends to chop ONE BILLION DOLLARS out from Education. Doing the math, right now the unbalanced budget has $13.2B set aside for Education, but we have to subtract out a massive $5B for pensions which brings it down to $8.2B for everything else in schools. Divided by 3862 public schools in the state of Illinois, that averages to roughly $2M per school or about $3993 per student. Unit 4 receives a little over $15M from the state (FY2014 state budget form) for the Educational Fund(*), which comes out to $1623 per student (9383 total students). Ironically, according to ISBE Superintendent Christopher Koch, the “statutory amount set for general state aid” per child is $6119. Which is obviously meaningless and a sad joke. There is a ton of talk about “pension reform” and I have not figured out how the proposed “balanced budget” of chopping $1B will affect pensions. If we assume the worst-case scenario where pensions are left alone, that brings the money for Education down to $7.2B, or $1.86M average per school ($3505 per student); for Unit 4, an oversimplified guess would put the cut at $2.1M (total down to $13.3M), or $1421.6 per student. Unit 4 has a $103M budget(*), and Gene Logas and the rest of the Finance team has placed us in a really well-padded financial position. Except we are cutting into that buffer space with additional raises for both teachers and administrators over the next three years due to the contract negotiations last year. * UPDATE NOTE: The total Unit 4 budget is $138,853,108 – I am focusing on the Educational portion of the budget from which teachers are paid (among other things). It is quite unclear how Gov. Quinn’s promise to protect Early Childhood Learning will play into this picture. I am not smart enough to figure that out. *grin* If you are, or if you know of someone who is, please pitch in. All this to say that I am quite confident Unit 4 will be fine for the next few years, but we have to be diligent and very careful with how we plan our future. My sincere hope is that all stakeholders can come to the table to exercise “community involved planning” to dream up ways we can maximize our dollars. Aside from posing the question here, I also asked Dr. Wiegand, the Board, the Regional Superintendent Jane Quinlan, State Superintendent Chris Koch (pronounced “Cook”) and had a lovely chat with Dr. Lynda Vaughn of the Public School Recognition Division of the ISBE General Counsel. I dug around in the Illinois Compiled Statues section 105 (ILCS 105 – School Code) and Article X of the Illinois State Constitution. The latter led me to do some googling about the nation’s Constitution and found some rather intriguing websites pontificating on the sorry state of how we citizens have given away too much power to the government (1, 2, 3). I initially had this desire to get a reading on the general feel for why we send our kids to school. My exploration has led me on a journey across many landscapes; and I do not think I have reached the end, yet. But let us get back to the basic question. Why do you send your child to school? We all assume this is a no-brainer. “Well, duh! So they can learn stuff” I could even project this out to any kind of school including those who homeschool. We all think that a child should go to school. But when I start to examine the root reasons behind that motivation, I start to find a wide variety of opinions, theories, conjecture, beliefs and goals.